Having trees that love to create seeds may be great if you are a squirrel, but if you are a human who does not like to have your grass smothered by acorns or deluged with elm seeds, then the battle lines are drawn. Such was the case in the fall. During this time, we used the wet/dry vac to collect much of the squirrel food. After many tubs of acorns and stray yard materials were sucked up into the “tub of judgement”, I felt pretty comfortable the yard had been insulated, as best as I was able, from the potential saplings that could result. The little elm seeds are less able to be quickly eradicated. They are much more insidious that the obvious acorn. They nestle into the mulch. They congregate in the gutters to be tossed randomly into whatever part of the yard will embrace them as the gutters are cleared again for water flow. The elm seeds partner with the wind so they are not limited to developing friendships in just our yard. Despite all of my efforts, the “weeds” are still coming in with no mercy. What is a weed? It is something that grows somewhere it is not supposed to grow. Weed mat installed in the flower beds did not prevent the elm seeds from germinating. I sacrificed many of the occupants of a future forest as they sprung up in my mulched beds. I pulled many a baby oak from the yard–the mother acorn providing the tail to the oak baby. As I make my rounds doing my dead heading of geraniums, I see new elm sprouts. While walking the yard to see the colors of the flowers, I will see a few more acorns attempting to extend their lives while being somewhat camouflaged by the St Augustine grass. While this time of pulling weeds will pass and focus will shift to making sure the yard and plants receive enough water to stay vibrant, the ambitious seeds of this spring are a reminder of potential life anxious to be truly born. I do wince a bit when I grab hold of the stems and remove the plant from the life-giving soil. I wince even more when I imagine my yard without someone overseeing it. And, while calling me a tree slayer may sound a little extreme, I pale in comparison to lumberjacks. 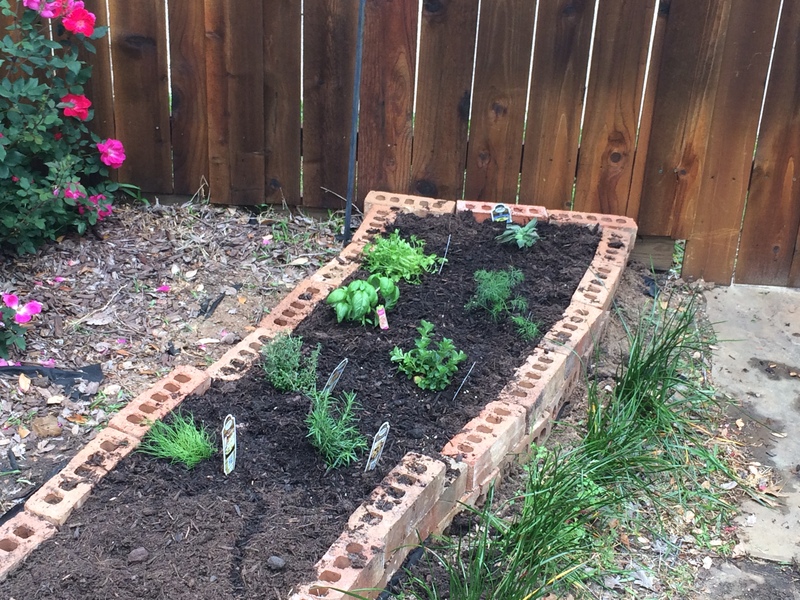 My daughter has wanted an herb garden for quite some time. She has suggested I rip up some plants from an area she believed was ideal. Once some transplanted plants from last falls projects were deemed “dead”, I let her know I had a place for her herbs. When she finally had some time available after church last Sunday afternoon, we ran the necessary errands to get the “stuff”. We needed to go the Sprout’s for groceries, but we found a nice selection of herbs as well. (Our 15% discount due to our “adopted sons” employment was helpful.) We gathered our spiced up soil and a couple more herbs at Home Depot. I considered getting landscaping stones to build an elevated bed before deciding to check out a few bricks from our “building materials that didn’t get used when the house was built” bank. As can be seen in the first picture shown with my daughter, the chosen area does have a grade. We ended up putting bricks over the bottom half of the rectangle. My daughter was impressed with how I used a level to confirm the bricks were mostly level across the course (Architecture definition – a continuous horizontal layer of brick, stone, or other material in a building). A sheet of weed mat was spread across the bed area before the full course of bricks was installed. Due to the grade change, we needed to run a 1/2 course of bricks on the top half of the bed to make sure there was enough soil available for planting there. 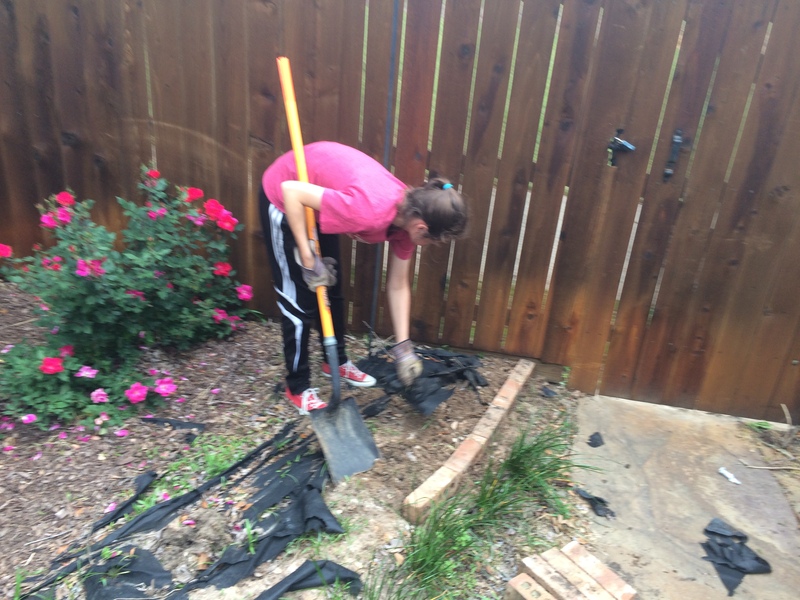 My daughter truly took ownership of the project. She realized creating a planting bed is more than digging a few holes. It seemed to have been a good weekend to do the planting. The days following were quite cool and rainy. The remaining issue is whether the sprinkler system will give the plants adequate drinks when the rain leaves. I truly hope the sage, parsley, basil, dill, rosemary, thyme, mint and dill (maybe a peppermint will join them) serve my daughter and the other women (and men) of the household well. 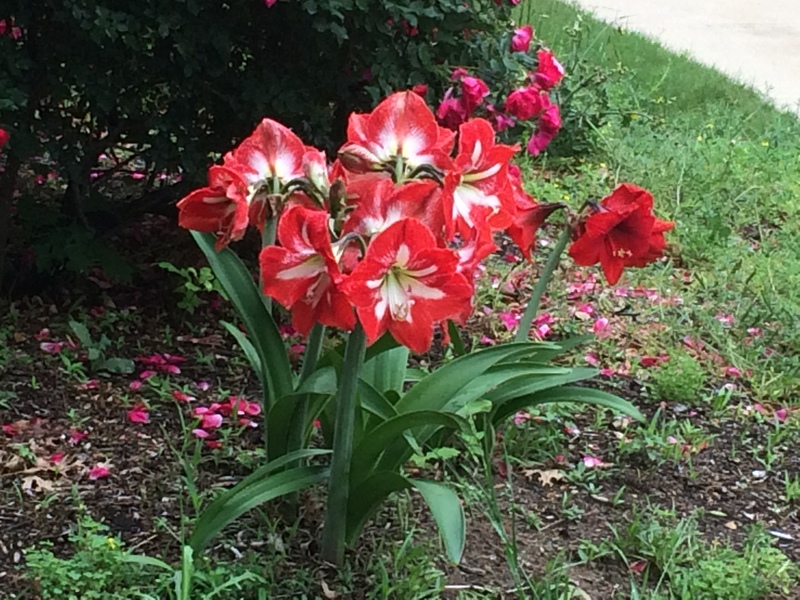 While in Ohio, the amaryllis was a great way to help forget winter. When the temperatures were cold out (usually after the first of the year), I would plant a new amaryllis or pull my old amaryllis out of the basement. Before we left, I had 5+ bulbs I planted every year. They truly did bring a smile to my face. 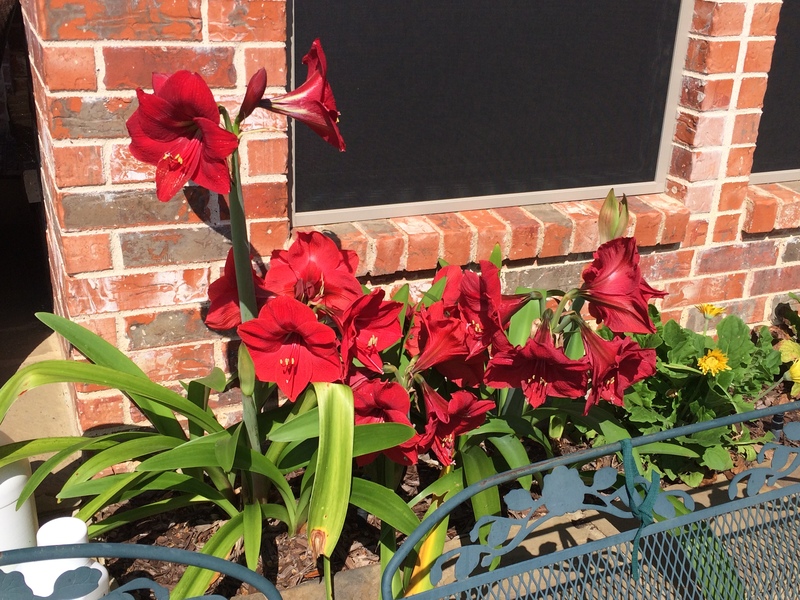 Now, in Texas, the amaryllis can stay outside all year. My only responsibility is making sure they have a place to live and get watered occasionally. The only downside is the red amaryllis seem to be the best bulbs for blooming. While I still love the hug, monstrous, red blooms, the peppermint amaryllis is still my favorite. (Note: I do consistently like pink in my flowers.) Maybe if I plan well, I can save some room in the hood for a pinkish amaryllis next year. When I landscaped during college, we did lots of planting of annuals and perennials. This was especially true as many of the houses we landscaped were integrated into the Murfield Golf Course. One of those annuals was the geraniums. The red geraniums were quite beautiful, but they were a little too common. My favorite was the salmon covered geraniums. Their pink color seemed to be the correct shade of spring for me. So, when I see a yard dominated by salmonish (pink) colors with only minor transgressions into red, I can’t help but take a picture. (My camera is rarely about, but I have this phone…. I use it as a frequent Plan B.) 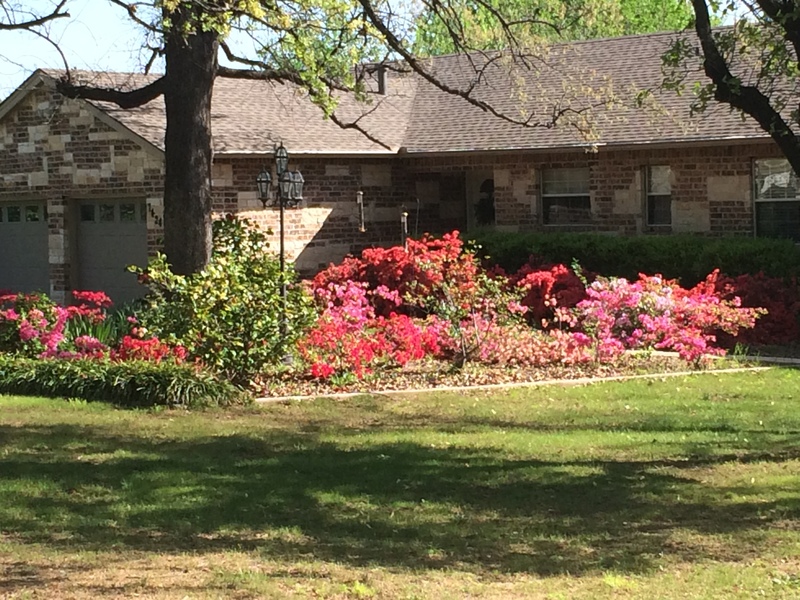 I think the hardest thing about spring in Texas is how quickly it arrives. It leaves without warning. I have always loved flowers and the color they provided. I don’t think this is true with most men. They may claim to like flowers after their wife has them plant a few flats of impatiens, marigolds, or geraniums. While they give lip service to it, I don’t think the true appreciation comes until we get older. As we get older and nearer our graves, we can more easily appreciate the beauty in the small things. One bloom may barely register. When one bloom gets together with a few other blooms, it is stunning. When multiple plants all bloom at the same time in the same location, it is worth pausing and attempting to capture the image with whatever meager tools we have available. This image is only a bookmark to a place in my brain where the more much vibrant colors will stay for quite some time. It was supposed to be “first frost” night in north Texas a couple night ago. Just like kids coming down to see what Santa left them, I rushed outside to check if my uncovered geraniums survived their night of peril. Now that they have proven themselves worthy, I will probably try and stretch their life out a few more days/weeks. My interaction with geraniums was not always this way. When we lived in Ohio, we handled them completely differently. In Ohio, geraniums seem to really grow! Texas heat has made an exception to “everything is bigger in Texas”. We planted 3 geraniums here. They grew, but they certainly were not full. 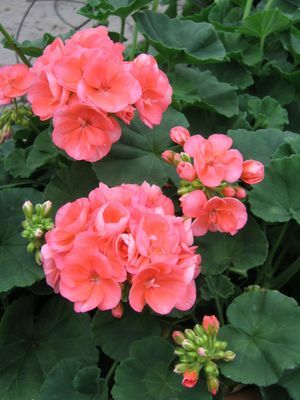 In Ohio, geraniums were usually planted after the last frost. (Rarely later than 5/15. And, if the weather from 5/5 looked good, we would often plant them earlier. If we committed to covering them if a frosting occurred, we might even plant them a few weeks before the last frost.) We usually planted a few new geraniums. Our little trick (Actually, my grandmother’s trick. She did about what we did, but she wintered hers in a dark corner of her basement.) was pulling geraniums from last year out of the basement and seeing which ones could be reincarnated and brought out of their winter slumber. I dug each of the geraniums, shook the dirt out, and set them down on a piece of newspaper in the garage. I let them dry out for a few days or weeks OR until I remembered. Somewhere in April or early May, I would find the nasty spiderweb friendly part of the basement where i deposited my precious-es. I would bring them outside and put them in a bucket of warm water. They would soak awhile and hopefully provide some clear clues that they still had life dwelling within them. The mortality rate was high. If I got over 50% of them coming back, I was happy. Of course, the true mortality rate was not apparent until they were in the ground for a couple of weeks. The biggest did not always survive, and the smallest were often pretty spunky. We did have one of the geraniums that survived multiple years. (maybe 5?) He was wide and had an attitude. Fortunately, he backed it up with beautiful, endless blooms….once he recovered from his amnesia. When we moved to Texas, our geranium collection did not make the trip with us. I was sorry to see them go. (I didn’t really see them go. It just wasn’t practical considering the many miles and the happy years they gave us. Unfortunately, they likely ended up in a trash can rather than dying in the ground as the full moon beamed down upon them.) Fortunately, although Texas is not fond of geraniums, it does allow amaryllises to stay out all winter long. So, although it is not a completely fair trade, I will enjoy the blooms I am given!